The exhibition at the Tate Modern, London explores the visual culture that emerged after the October Revolution in 1917. The exhibition is primarily drawn from the collection of graphic designer, photographer and historian David King (1943-2016), who began collecting Russian and Soviet material in the 2970s. King contributed to the planning of the exhibition right up until his death in May 2016. I was drawn to this exhibition because I wanted to learn more about the Soviet design of the era and interested in the powerful, bold, aggressive style of soviet and fascist design. The first room you enter upon arriving at the exhibition is room 1: ‘Art onto the Streets!’ where are you are confronted with a wall of different posters. My favourite is this piece by Adolf Strakhov in 1926 called ‘Emancipated Woman: Building Socialism!’, which is also the face of the exhibition. The image shows a woman worker shouldering her equal rights and taking her place in the centre of a new society, which firmly endorses the need to increase production in the factories. It reads "Emancipated woman — Build up socialism." 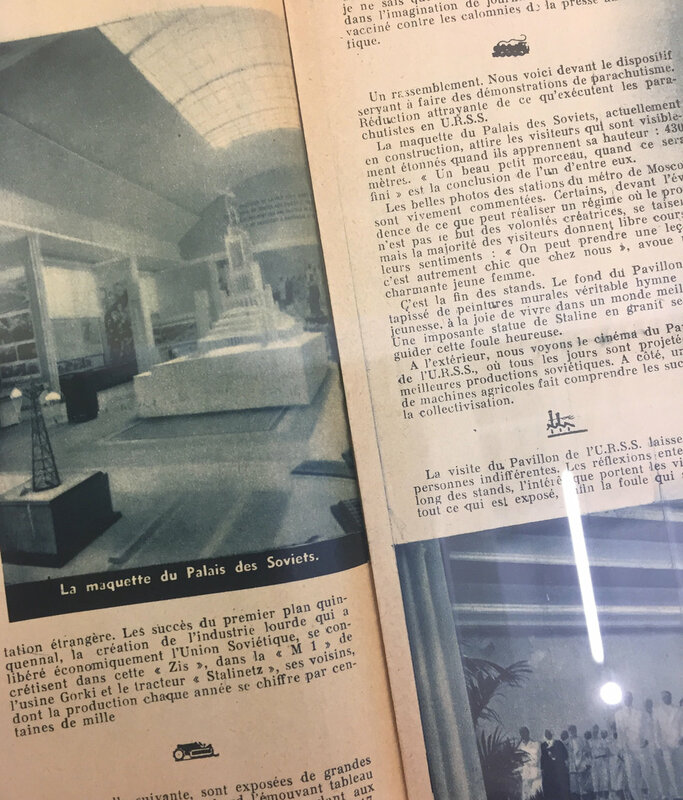 In room 4, ‘1937: A View from Paris’ is a copy of Russia Today, from November 1937. I found the editorial side of this really interesting. The typeface used at the head of the spread is really angular and exactly what comes to mind when thinking about that ear of history. The harsh edges, squeezed and tall letters have a very empowering feel. I noticed within the pages some really nicely designed small icons, presumably separating each topic of the article which as an editorial spread works really nicely to break up the block of text. In room 5: ‘Ordinary Citizens’ was some examples of Stalinist photographic retouching, which was really interesting. These 3 images (below) are the most famous examples of the retouching. They show individuals from the leader’s inner circle who had fallen out of favour and been eliminated and edited out from official images. David King explains how this was an essential tool in the rewriting of Soviet history during the Stalinist period. In the final room, room 6: ‘The War and the ‘Thaw’’. Following the German invasion on June 22nd 1941, soviet propaganda immediately mobilised citizens into action. The image of Stalin could no longer be expected to inspire loyalty and the symbolic figure of the ‘Motherland’ began to replace that of the leader. One of the final exhibits was posters which was a really strong piece to end on. The pair of posters were called ‘Don’t chatter! Gossiping Boarders on Treason’ (1941) by Nina Vatolina (1915-2002) and ‘Don’t chatter!’ (1942) by K. Kazymov (below). This really gives you a feel of what it must be like living in such a different society that we are lucky enough to live in in England, and the suppression and control over society. The exhibition is currently on at the Tate Modern and ends on the 18thof February 2018 and I would highly recommend going. Admission is £12 or free to Tate Members. All images are photographed by Hugh van der Lande in the exhibition at the Tate Modern.